Last night in Tampere, Finland, I put a young and hungry Luchadore-style grappler named El Excentrico to the test in a one-on-one match. I feel compelled to write about the bout, as I was rather impressed by Excentrico’s effort. Oftentimes, as is par for the course in professional wrestling, an experienced grappler will test the mettle of a young upstart to see what he is made of. A veteran will push the boundaries of a young talent to see if they have what it takes, if they can hang in there even. And yes, at times, a veteran can get ornery with a youngster, making them pay some extra dues in the process, but that is just the way the business is. I have to say that El Excentrico, who has an admirable attitude and great respect for the business, hung in there every step of the way. I was there in the beginning when Excentrico started out, coaching him over 2008, and he didn’t show the kind of promise back then that he now holds. I honestly can say that I hope Excentrico stays injury-free, as his knees have given him all kinds of bad luck, and have withheld his career from really taking off. 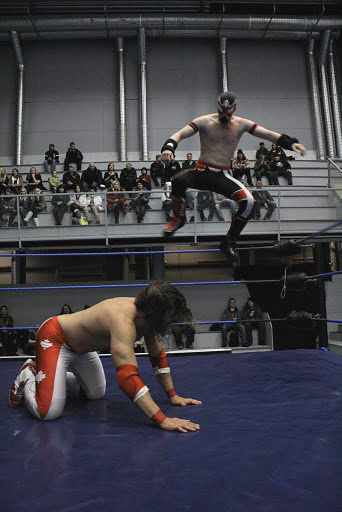 Tampereen Turmio, the FCF Wrestling event at which I faced Excentrico yesterday, was a proving ground for Excentrico. I took him to school a bit, and he survived, even if he fell to the master after a piledriver. And believe me when I say that losing to a top wrestler and still hanging in there is no case for shame. I predict a bright future for this kid, if he can stay healthy and keep his head together. That said, you will have the opportunity to see us both wrestle – this time against different opponents however – this coming Saturday, February 19 at Aalto-Sali in Jyväskylä in central Finland.